Scroll over photo to study the loss of glacier mass between 1921 and 2007. The surface area of glaciers in these high altitude valleys is often covered by layers of debris or snow. 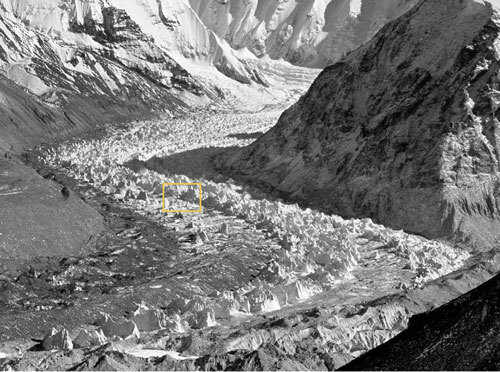 To determine the full measure of loss in the ice mass in these photos, look not only at how far the glaciers have receded, but at the surrounding valley walls. In many cases, the loss in depth is upwards of 300 vertical feet. 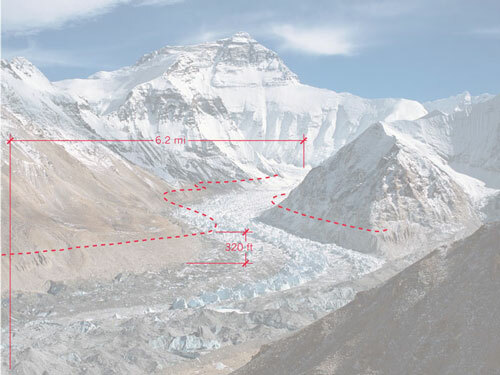 The dotted line shows the Main Rongbuk Glacier’s height in 1921. 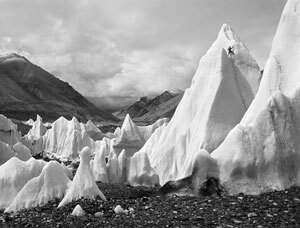 This photo from 2007 reveals a loss of 320 vertical feet in ice mass since George Mallory took the same photograph in 1921. A detail of the yellow box is shown below. The climber (upper right) gives scale to the ice pinnacles, Main Rongbuk Glacier, Jimmy Chin, 2007. Courtesy of the artist.